COMEDY Two hungry people stare into an empty chicken coop and debate whether to cook and eat a nonexistent chicken. 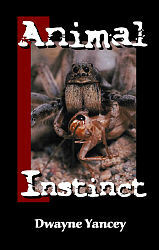 Included in the short play collection "Animal Instinct." Dwayne Yancey has published several plays and some of his works have been produced in New York by professional theatres. Yancey lives in the Blue Ridge Mountains with his wife and two children, all of whom are veterans of the community theatre stage.